Monday February 5th, 2018 on the market happened what most traders thought impossible: the VIX index suddenly jumped 138%, its biggest jump ever, with US equity markets down 6% in the worst slide since 2011. Why is this so important? After all, a 6% correction after years of bullish equities seems normal or even healthy for the market as it creates new buy opportunities for those who missed the last years’ rally or those who want to increase their positions since fundamentals are still strong. The importance of this event stays all in the VIX, widely and incorrectly known as the “fear gauge” of the market, which suddenly awakened from a sleep lasted for years…. and it seems it got out of bed with the wrong foot. As explained in my previous article about this topic, there is plenty of ETFs and ETNs with the VIX as an underlying and some of these are shorting VIX futures. The most traded of these is, was, the XIV, an ETN who is shorting short-term VIX futures and tracked incredible performances in recent years making many “Short-Vol Traders” rich. Well on Monday we saw this instrument imploding spectacularly forcing the issuer, Credit Suisse, to announce the “acceleration event” settling down the XIV at the price of $4.22 (it was trading at $115.55 on Friday) and stating that there will never be new issues of the instrument in the future. 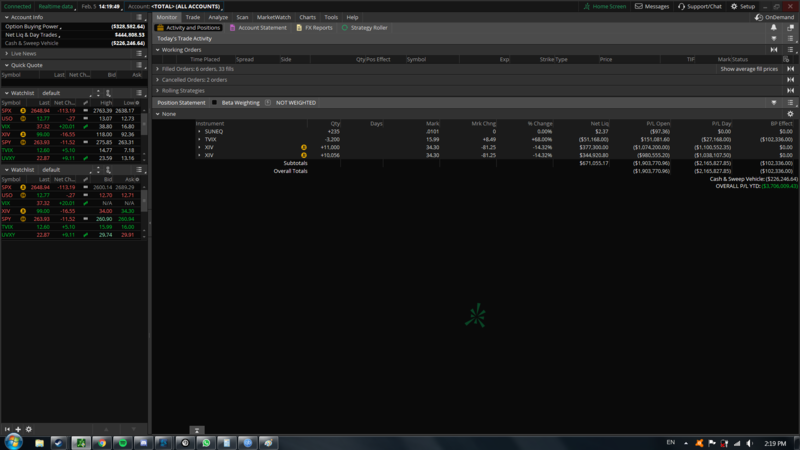 The operation suddenly burned over $1.5 billion in assets on the XIV alone which could seem like not of big deal. But XIV wasn’t the only way to get short volatility exposure; Chris Cole from Artemis Capital Management, a volatility hedge fund, estimates the amount of short VIX bets outstanding (carried forward by various strategies including options short vega exposure and other derivatives) closer to $2 trillion. As many of you surely remember, I was asking myself in late November 2017 if one of the most crowded and profitable trade of our times, the short-vol trade, was going to backfire and eventually turn into a Russian roulette for its fans. Well, shortly after showing my fears I got my answers. But how could this ever happen? The market was going down fast and we know that market and volatility are historically negatively correlated, following the old saying “markets get up with stairs and get down with the elevator”. So, if the S&P drops we should expect a rise in the VIX index. But was a sudden 6% drop in the index the only reason behind the jump in volatility? The collapse of US equities has indeed been the trigger of what we saw happening on Monday, but if the S&P drop was the fuse the massive short-vol bets were the powder keg. In practice, ETNs like XIV get exposure to volatility through short selling short term VIX futures, as the VIX started rising on Monday short-vol ETNs had to rebalance their portfolios going on the market buying massive amount of VIX futures, especially in short term, to cover up their exposure which became enormous compared to their tanking NAV. The result was a massive jump in VIX futures prices as this illiquid market wasn’t ready to manage such a giant buy order flow. When I went checking the term structure of these futures I was terrified. The term structure immediately switched to backwardation as it happens during massive market panics such as the Lehman crisis in 2008. 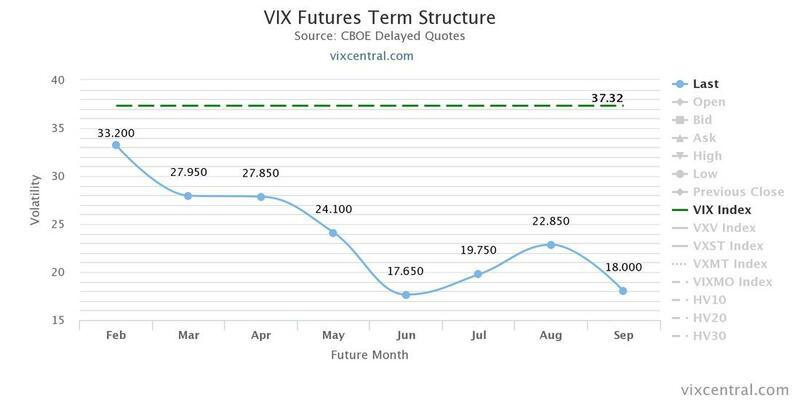 The steep slide in futures prices from April to June is the result of the inflated short term futures prices due to the need of rebalance of short-vol positions and the overall irrationality of the term structure is due to the massive bid-ask spreads being generated by the dried-up liquidity. Long story short, the short-vol bets needed to be rebalanced starting a vicious cycle where ETNs issuers tried to cover their positions buying VIX futures pushing prices up, increasing the need for rebalance and so on. The result of this huge need for rebalance has been a 95% drop in XIV after hours, remember that Credit Suisse had the contractual obligation to rebalance its ETNs at any cost during afterhours probably buying futures at obscene high prices. This is a chart you’re unlikely to see ever again (again afterhours prices are in the dark bends). Credit Suisse confirmed it reported no trading losses from the almost 5 million XIV shares owned due to accurate hedging policies, but retail and greedy institutional investors lost all. Shortly after the XIV spectacular implosion Credit Suisse announced the “Acceleration Event”, a right to call the ETN if it drops more than 80% in a single day, announcing that all XIV shares will be settled for $4.22 and the last trading day for XIV will be February the 20th. After the announcement people started posting on Reddit their desperation in search for advice and kind words from the community. The trade who made them, to use their worlds, “stupidly rich” left them with the ashes of one of the most spectacular bubbles we saw in recent history. There are stories of soldiers who came back from Afghanistan and invested all their wealth in XIV and other short volatility products turning $50,000 into $4,000,000 and going back to almost zero, leaving them without money they relied on for the future. Now they are asking the Reddit community for help and support, one of these asked if he should kill himself right after having setted a New Year resolution of hitting $4 million net worth in another thread on Reddit a month ago. Here's a trading account of one of the desperate XIV traders who started posting on Reddit, it shows a loss of $3.7 million in one day. I remember my Derivatives professor at UW Madison saying to the class: “Buy XIV now, you’ll probably be exposed to huge drawdowns in the short term, but if you’ll hold it to retirement… You’ll retire rich, I personally guarantee that”. ​Seems to me that easy money is never like it seems. And when you hear about that you better walk away, and fast. But there are also stories of traders who made stellar returns like a little Denver hedge fund who turned a $200,000 bet in VIX put options into $17.5 million overnight (they bought at $0.35 a piece and sold for $28) noticing that the market was pricing at 1/5000 what, according to their models, it was a 1/1500 event and saw the opportunity to buy. They also reported their broker in Wall Street laughed when he heard what they wanted to do saying that there was no way the VIX will explode and volatility was dead. At the end what can we say? This is the story of the spectacular end of one of the most popular trade of our times. It is a story about greed, about impossible events becoming reality and about the slaughter of retail and reckless investors. This is a story about Wall Street.